Licensing Parents to Protect Our Children? 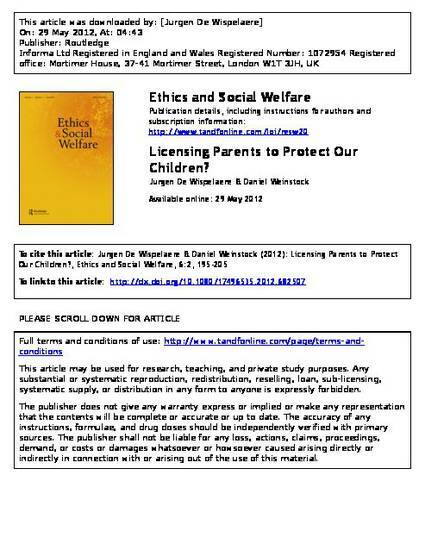 In this paper we re-examine Hugh LaFollette’s proposal that the state carefully determine the eligibility and suitability of prospective parents before granting them a ‘license to parent’. Assuming a prima facie case for licensing parents grounded in our duty to promote the welfare of the child, we offer several considerations that complicate LaFollette’s radical proposal. We suggest that LaFollette can only escape these problems by revising his proposal in a way that renders the license effectively obsolete, a route he implicitly adopts in his recent revisiting of the licensing proposal. We conclude that there is little merit in the idea of licensing ‘natural’ parents as a practical policy proposal, and raise some questions about its continued use in relation to adoptive and foster parents.